The Hershey Bears beat the Grand Rapids Griffins 6-4 Saturday night at the Giant Center in Hershey. The win raises the Bears record to 15-18-0-2 on the season. 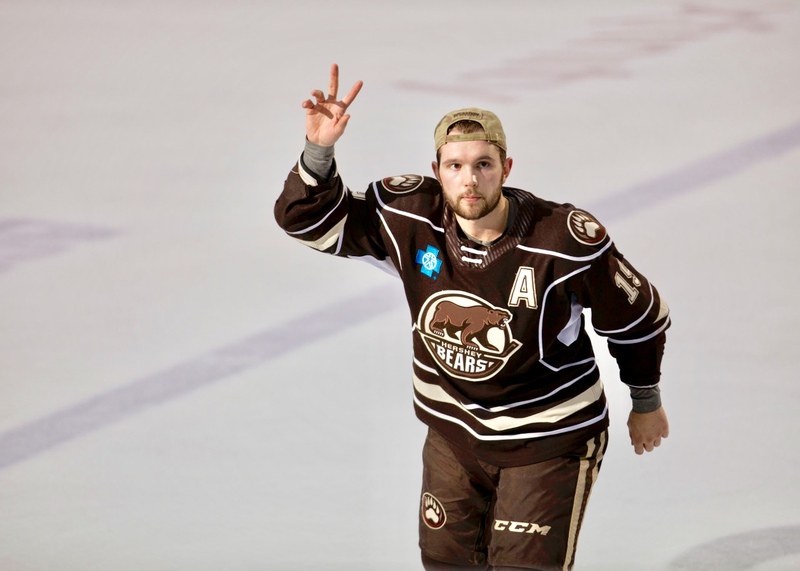 The Bears are back in action Sunday evening when they host the Milwaukee Admirals at Giant Center. Puck drop is set for 5:00 PM. The Bears struck quickly in this one. Brian Pinho and Riley Barber would make it 2-0 Bears in the first 10 minutes of play. After the Griffins got on the scorebaord, Shane Gersich restored the two goal lead for a 3-1 lead at the first intermission. After a scoreless second period, the Bears would add two quick goals but the Griffins wouldn’t go away quietly. They would add three late goals to make it seem closer than it actually was. Shane Gersich returned to the lineup for the first time since December 7 (10 games). Tyler Lewington returned to the lineup after being re-assigned from Washington on December 31. Tobias Geisser returned from the World Juniors tournament on Friday, but was not in the lineup. Geisser’s last game with the Bears was December 16. Scratches: Lucas Johansen (upper body), Connor Hobbs (upper body), Kris Bindulis (upper body) and Tobias Geisser (upper body) were the injury scratches. Max Kammerer, was a healthy scratch. The Bears would strike first with a nice breakout by Garrett Pilon, and finish by Juuso Ikonen and Brian Pinho at 8:55 of the first frame. The goal was Pinho’s second of the season. Juuso Ikonen (6) and Garrett Pilon (10) were credited with the assists. The Bears would quickly make it 2-0 with a seeing-eye goal from Riley Barber at 11:01 of the first period. Barber would deflect a shot from the point by Aaron Ness. Aaron Ness (18) and Mike Sgarbossa (11) were credited with the helpers. The Griffins would respond. Wade Megan would make it 2-1 with a goal at 12:37 of the opening stanza. Shane Gersich would restore the two goal margin with a top-shelf tally at 15:14, making it 3-1 Bears. Garrett Pilon (11) and Beck Malenstyn (2) were credited with the assists. The first period would end with the Bears leading 3-1. Shots on goal were tied 12-12 for the first period. The Bears were 0 for 1 on the power play. The Griffins did not have a power play in the first period. The Bears faced a 4-minute penalty kill midway through the period when Colby Williams was called for high sticking, and the Bears penalty kill came up big, keeping the game at 3-1. The second period would go scoreless. The Griffins outshot the Bears 14-6 for the middle frame, and led 26-18 after 40 minutes of play. The Bears would make it 4-1 early in the final frame. Aaron Ness would rip a laser past Sateri at 1:50 of the third period. Riley Barber (14) and Nathan Walker (6) were credited with the helpers. The Bears would make it 5-2 with a power play goal from Riley Barber at 12:35 of the third period. The goal was not initially called, and play continued. Barber would score again before the stoppage in play allowed the officials to deem Barbers first goal was good. The Griffins would quickly answer with a goal from Matthew Ford at 7:37 of the final frame, making it 5-2 Bears. Ryan Sproul would restore the four-goal lead at 9:41 with a filthy power play dagger, making it 6-2. Colby Williams (10) and Riley Barber (15) were credited with the assists. Grand Rapids would get one back with a goal from Chris Terry at 14:13 of the third period, making it 6-3. The Griffins would add one more for the 6-4 final. Grand Rapids outshot Hershey 39-31 for the game. Riley Barber had 4 points (two goals and two assists). Garrett Pilon had 3 points (three assists). Aaron Ness had 3 points (one goal, two assists). Vitek Vanecek stopped 35 of 39 shots he faced. Grand Rapids was 0 for 4 and Hershey was 2 for 3 on the power play. 10th all-time meeting with Grand Rapids. The Bears. It's hockey time! This entry was posted in Game Re-Caps, Hershey Bears, News and tagged Aaron Ness, Brian Pinho, Grand Rapids Griffins, Hershey Bears, Jon Sorensen, Riley Barber, Ryan Sprouls, Shane Gersich. Bookmark the permalink.